Check out artwork on display this month in the 2016 Juried Student Exhibition in the Center for the Visual Arts Gallery on the University’s Toledo Museum of Art Campus. 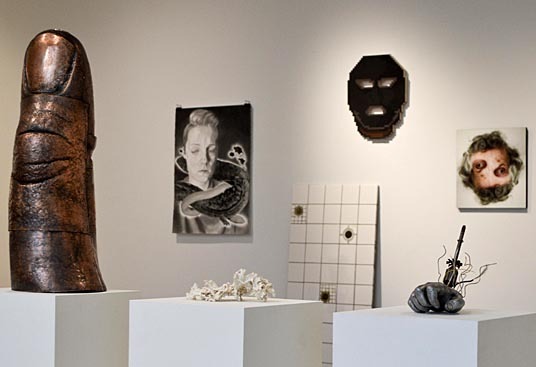 A reception and awards ceremony will take place Thursday, March 17, from 6 to 8 p.m.
See the best creations in the 2016 Juried Student Exhibition in the Center for the Visual Arts Gallery through Wednesday, March 23. UT students of all ages and areas of study were permitted to submit up to three pieces of original artwork for the annual competitive event. This year’s juror is Paula Baldoni, gallery director and owner of River House Arts Gallery in Perrysburg, Ohio. The free, public exhibit can be seen through Wednesday, March 23. Gallery hours are Monday through Saturday from 9 a.m. to 9 p.m. and Sunday from 10 a.m. to 9 p.m. This entry was posted on Tuesday, March 15th, 2016 at 3:05 am and is filed under Arts, Events, UToday, — Communication and the Arts .